fast charging stations are more widely available, though an exception would be for certain government and business fleets. Obviously some people might want one! 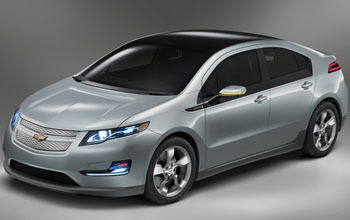 Atrios gets this right: the Volt is basically a hybrid, though not of the same type as a Prius. I’m not sure why I care about this, but for some reason an awful lot of people think the Volt is a “pure” electric vehicle. It’s not. It’s got a gasoline engine that kicks in when the battery gets low, charging the battery as you drive. It’s true that the drivetrain is pure electric (the gasoline engine is there purely to charge the battery), but the range of the Volt is far more than the 40 miles you usually hear about. Basically, if you do, say, 90% of your driving around town, there’s a good chance that 90% of your driving will be purely electric. When you take longer trips, though, the gasoline engine will kick in to keep you going for as long as you want. That makes it a pretty versatile car. Of course, it still costs $40,000. That’s probably a bigger drawback than the technology. Still, if you do most of your driving locally, and then add in a government subsidy that you might get, the Volt could end up being a decent deal in the long run.